What surprise's me is that no one at Kixeye reads this stuff . STG seem a step in the right direction, but it action and implementation that will speak the loudest. The community as nothin agasin the actual team of BP, but experience as tough us to be on our toes and not get overjoyed. You talk about balance. IT isnt just PVP that is out of balance, but pve as well. Too much content, hulls who should last 1 year, no longer do, since we need to build more. The team remove 1 hull in events only to replace it for map targets. You want to make BP fun and engaging, then rebalance the cost of the game. Build and repair time have creeped up again beyind what the community consider reasonnable. WE all understand monetization is part of a game like battle pirate, but it obvious that BP as gone through a phase of over monetization. The team got a lot of work to do in the next 6 months if they want to even keep the players they have, and hopefully, bring back those that left. We all awant BP to reach 2020 and go beyond, but let be honest, at the rate player are leaving, it wont reach 2020, cause soon, either they re wont be enough players to maintain the game and most likely not enough to finance it, and we all know what that will lead to. In the end the team needs to find a midle ground where they game will be fun in both PVE and PVP aspects, make enough revenues to keep it running and not cost too much that players close there wallets. Again, lots of work to do, especialy with the global mistrust that has built up in the last few years. Each time the team takes a step in the right direction, they take 2 step back. So let see what the next few months holds. Then we can decide if it the right direction for us players. But so far, the team has taken bad decision since the beginning of 2018. Let hope you can turn the tide and make the second half better. I remember back in the day, like 2013, it took skill and a few fleets to take a base...now fleets go through bases like a hot knife through butter....no skill what-so-ever. Take me back to the skill days. Players first??? Hahahaha, I needed a good laugh after the day I had at work, thanks. More hot air from Kixeye, just like all the other SoTG posts, and next year we will look back and see that it was nothing but another bunch of lies. Okay, all of this about the Apollo and Zoes Apollo is fantastic, even if they will NOT help in the current assault cycle. Hell, even Skyfires and Phoenix wont help now either. And, has Kixeye addressed the fact that nearly no fleet 99% of us have will be able to crack the SSRB's as has been mentioned MANY times in the discussion thread? With those things being virtually undefeatable, we STILL can not get base parts and uranium for the lower to mid level players. There are very few uranium, titanium and base parts targets around the SSRB when you compare those numbers to the number of players actually IN the sector, fighting to get to the aforementioned targets. Think Kixeye is running for the honor of the most non listening to its players and messing up a game ever by a gaming company award worldwide. When a company says that the customer is first, It really means nothing. And why is it nothing? Very easy, because we had a discussion topic in the forum called 8.23 Discussion Thread with more 8.2K visits where colleagues like me were talking about the latest Sub Sector Resource Base update and by the way nothing happy and it has disappeared for the art of magic or an innocent hand at Kixeye. To summarize, they do not listen and on top they say that we are first. You need to get rid of that **** ladder system for claiming prizes. Instead of grinding for a prize I want, I have to grind, and grind, and grind to claim something I don't need or want just to spend all those points and start from scratch again. Let me decide what I want and work towards that once. After all you have done to dis the player base and repeatably lie and mis lead this is supposed to have any creditability? How does a player that has been on a 2 year break, there about, get a level 7 turret? I have blunderbuss and 1 Executioner 2--both of which are not stopping a thing. The 5 players with the most points during the event earn an empty-pre-built Caedes ship! But haven't you heard Base's are all over powered ! So, now we're being forced to build the proto-centurion. Am I mistaken or wasn't there just two siege fleets created for last raid cycle? What happened to their lifespan huh? They seem pretty **** obsolete now... But I guess the forced refits on the buc and hydra for those 4 months to keep up with the elite target was pointless. Why are we still being forced garbage constantly. Just once can kixeye keep their **** promises. I played the game for a couple yrs and stopped in 2013. I came back recently and now I remember why I quit. I'm already considering leaving again. I'm a lvl 61 currently and I can be annihilated by a lvl 100+ with impunity with no real way of defending myself against their lvl 400+ flts. So you say you want to make PvP more fair. What's more fair than putting a range in where you can attack say, 10 levels up or down, something similar to what it is before you hit lvl 50 and suddenly become fair game for anyone. This will stop players like myself from becoming some much higher level player's farm b*tch and will keep us motivated to stay in the game. Or set up some huge penalty, losing all current XP for the level they're on for example, which will make them seriously consider whether or not they really want to suffer the penalty in order to hit a much lower player. But of course, I'm sure it's all about the money so by leaving us lower levels to the wolves, we have to coin if we want to stay competitive, be able to finish FMs and get the tech, repair bases and ships in a timely fashion, speed up production of ships that might be our silver bullets, and so forth. So there's no real incentive to fix this particular problem, is there? Defensor Fortis! It's been awhile since I have posted anything because I felt it fell on deaf ears. Once again you ( Kixeye ) claim that removing the Javlin 2 from the bounty was to try and balance Ships and bases to a equal level. Well I didn't see where that leveled the field, especially when you have fleets like the unstoppable Gen. with remote firing that reaches into the middle of a base. The bases don't have any weapon that can reach those ships that stay outside the base while MSC's cruise in to activate the remote firing of these ships. At one time there was a level paying field between ships and bases. A base should be some what stronger then any attacking fleet. And the attacking fleet should use some stratergy to attack a base. with or with out the javlin 2 bases still aren't on an even playing field. Also players High and low end are becoming more and more discourage with game play because the game has become more and more like a chore then a pleasurable game. With all the different items that need to be collected with continuing increasingly high damage levels and difficulties in killing these targets for resources. Instead of backing down the difficulty some to allow for more actual game play for PvP or PvE. Lets take a few steps back and go back to the format we had years ago where we had a more even playing field and bases weren't such a push over and players had to use thought and stratergy to take someone base. and resources were easier to collect. most players especially those who DO NOT coin are constantly playing catch up. We don't need a raid every month. Give the players time to build the new ships before another raid is introduced. Like it was in the distant past. Show the players that you ( Kixeye ) are putting the players first and putting the enjoyment back into the game. To start with, one of the most common complaints for the last year has been lag and game performance. Battle Pirates is a Flash game. Flash does not natively support using a graphics processor unit to load images. The first attempt to solve this graphics problem was reducing the number of projectiles was not well received because it affected your experience in battle. Nice job. Starting out with a lie or at least a misrepresentation. You did not attempt to solve lag by reducing the number of projectiles. You attempted to introduce invisible damage (maybe not even intentionally) by reducing the number of projectiles displayed. Actually reducing the number of projectiles in any target's design would have not only been accepted by the community, we would not have even NOTICED that you guys were intentionally trying to keep the number of mortars the Gluts were firing to a sane number if you'd done it from the start when they were introduced. But no, you tried to duct tape over a problem you guys created and didn't know about because you don't even test your own targets before pushing them on us. Identify them to us first, WITH ENOUGH TIME TO ACTUALLY ADAPT TO THEM. This means at least a month, probably even 3 months honestly given how little slack time you allow in the shipyards. No. Point blank, you are simply wrong. You guys have your heads shoved completely up your collective **** here. Balance has NOT swung to the defender side. The power "creep" on the defender side was rocketed to the stratosphere for anyone with ABSOLUTELY ALL LIMITED TURRET PRINTS. Anyone with 6 Ballistic Tier 7 Group Bonuses has a base that will rip apart Storms like a puppy through a wood chipper. Anyone else? Well, their base is absolute junk. I'm a lvl 116. I skipped a Bounty, missed the Blunderbus 2's, so I'm stuck with only 4 Howie 6 Bonuses. The result? I have to be on and driving my guard to even have a chance at base defense. Pull my guard? My base is as damaging as a lvl 50, and my turrets only do pass thru to properly built Storms or Impacts. My base can be 100% leveled for **** instant repair on the map. This is as broken as can be. So yeah, I'm so grateful you pulled the Jav 2s mid-Bounty when I was after them to get my base up to speed again. All you guys have done is re-create the "too many Fire Supports" problem of 2017 via the group bonuses for 2018. 99% of bases are **** farms to the newest ships and players might as well scrap their turrets that are only doing 360 damage at a time, and you're telling us they need to be weaker? The majority consensus on that is "go **** yourselves." You don't have any clue what you're doing, and you're about to make a bad problem worse. You need to nerf both sides. Scrap the group bonus idea, and reconfigure all the T7 tech deflections. Go back to the drawing board. The really funny thing is you're saying turrets weren't supposed to get multiplicative bonuses, yet the newest hulls and the newest armors math out perfectly to counter each quantity of turret bonuses we've seen. We're sick and tired of limited tech. We've been sick and tired of it for over a year now. And your solution is to make it mandatory in all aspects of the game. Lighten the load already. It's not strategy at all. It's simply a game of "do you own everything?" If yes, then you win. If no, then you don't have a chance. You have taken the problem of a divide between the "haves" and "have nots" and exacerbated it. The devs really need to ask themselves this question, why are any of these prints limited? The answer is quite simple, "this item is overpowered, and we wouldn't want any player to have too many of them." And there is the fundamental problem, these items are overpowered, AND YOU KNEW THIS WHEN YOU CREATED THEM. You intentionally created overpowered items that would give players an edge by having them. These swings are deliberate. They're done to generate coining, and they have resulted in a game that is so beyond screwed up that it's barely playable. Oh really? Is that why you created "charge depleting" tech that negates how Charged Armor is supposed to behave RIGHT THERE ON THE PRINT IN THE STATS? Is this a joke? They still have to build them. And by the time they have them built, the targets will have changed to the new map targets for which those old obsolete hulls do not work. You haven't brought old tech build times down. Hit the ground running... Running straight to the shipyard to start a 2 month wait! Boy, doesn't that sound like FUN! Waiting around for 2 months just to learn the ships don't perform well. That'll surely make them remember why they quit logging in the last time. Clueless. Skyfires and Phoenix did horribly in last month's event. Apollos are going to do even worse. The idea that you're encouraging low level or new players to build Apollos is frankly disgusting. It's severely unethical. You guys know Apollos are junk. That's why you're offering to sell me an entire fleet with flag for 5 bucks when just the VXP tokens to only halfway rank a single Makara Manticore flag is $25. Actually, can you remove these? The end result of this was players that are already at capacity on Charged Armors now have to get more points in those tiers before they can claim the chest for tokens. I have 15 copies of the VIB already. I do not need more. The short term fixes have largely been announced to you. We’re addressing a serious bug causing turrets to deal radically increased damage. Only in edge cases, which you not only should have seen coming, YOU DESIGNED! Radically increased turret damage to help deal with unstoppable fleets having over 10 million health was what you sold us. We’re addressing an accuracy bug that was affecting all hulls, but was having it’s most profound effect on countermeasures effectiveness (making Defenders too strong). Great! This is freaking awesome to hear! Not only are you going to make my turrets worse, but you're going to make my guard worse too! The only thing even kind of working in my base is going to get worse as well. That's really bringing out the FUN! Can we get some lube? We’re releasing a Explosive Turret to help balance out base defenses. PvP has swung way, way too far in favor of defense and these changes swing the pendulum in the other direction. So the intention of this new turret is to make base defenses do LESS damage? Or is this new mortar turret intended to be mounted in the Tactical Module slot of Impact Cruisers? I mean, we put turrets on ships these days! Seriously, what the hell is wrong with you? In 1 sentence you announce releasing a new turret to balance and improve defense, and in the very next sentence you again make your erroneous claim that PvP too strongly favors defending? I need to say this again, base defense is only too strong at the very high end. Any setup below perfect, and PvP has swung way, way, way too far in favor of the attacker. In my base, base hits have become a FvF battle. My turrets are useless against properly built base fleets. I shouldn't be sinking fleets in 1 shot, but I should be able to do more than pass thru. Turrets should not be 100% ineffective. We keep swinging from 1 shot kills to death by 5000 pass thru cuts and back. Of course it's niche. That swing back and forth is not fun at all. You guys need to slow down whatever it is you're developing, AND ACTUALLY TEST IT BEFORE RELEASING IT to know which of those it's going to be. And if it's either, scrap that idea, start the f over, and create something that's an actual BATTLE that requires some thought. SOME thought, not a whole GD spreadsheet to figure out if it's going to do minimum damage or instawin. Currently the BP HQ allows you to launch fleets and auto targets. This cannot be true. I have been told explicitly that Kix has NEVER claimed any target could be done on auto. Maybe you should keep that smartass mod banned. Maybe try actually talking to players here on the forums instead of ignoring threads that tally up over 100 pages of complaints? That's how you put "players first" instead of the constant feeling of "players ignored." You just nuked the DUBs and Drac Bases, the former without a bit of official warning from Kix here on the official site and the latter without a warning anywhere. That shows just what you think about the players. We know. If you wanted actual fun in the game, you'd bring back the original Drac Bases from time to time (with little to no reward other than people being able to co-op with friends smashing stuff) like you did old raid targets back in Feb or so. You lost me at QUALITY.....SORRY. BPHQ App needs to work on more than just Facebook. 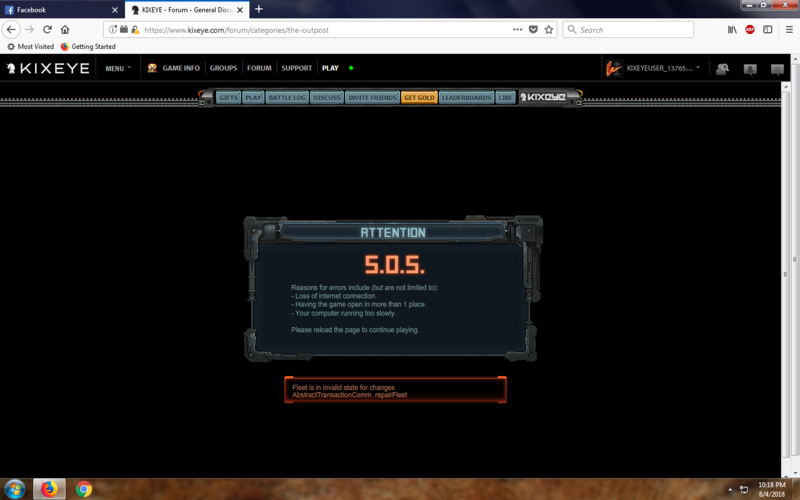 Why would you guys make something that wont even work on your own Kixeye.com platform for the game? how can returning players "catch up" yes the entry lvl hulls are available in the FM. but the flagships have no tokens so to build them takes too much shipyard time. really not helpful at all. Hahahaha - must be April 1st looking at this topic. Putting players first.............well, that'll be a first for BP. Hmmmm, but how many pages of outrage did the first Assault Raid generate ?? And what's the response ? To make the convoys larger and more powerful...............yep, that'll help put players first. Give out Apollo's in the FM. Considering how quickly Phoenix and Manticore fleets were dying in the raid, the Apollo's a waste of shipyard build time. Having some TLC's that are locked to specific hulls, or require specific tech (PBX etc)..........................yes, that's really helping players catch up. Changing the Drac bases to make them near impossible unless you've got the latest and greatest hulls - thanks, that's also putting players first. As for base defense, don't make me laugh. Many of the best turrets are only available IF you can score high in Bounty, or IF you can get to the locked prizes in the raids. Most are just watching point and click fleets trash their bases repeatedly - regardless of level. So thanks for putting players first, it's a great help. My own thoughts on putting players first. 1) Make the raids 'grindable' for those willing or able to put the seat time in. The current points to damage ratio means many struggle to get even a bargain basement useless prize. 2) Greatly reduce the build times on old hulls won in the FM. By the time you've built a fleet of Apollos or some other relic, chances are you may have won/bought a better fleet anyway. As it stands, the build times for these old fleets is just wasting valuable shipyard time. 3) As point 2, make the build time for flagships far less than it currently is. With no tokens for them, they're pointless unless you can spare nearly a month per hull in some cases (allowing for base hits etc). 4) Dial down the damage on TLC's and allow players to properly catch up. 6) Base defense. Stop giving the best turrets away in locked stores etc - make all defense items researchable. Ok, going to read and reply as objective as possible..
To start with, one of the most common complaints for the last year has been lag and game performance. Another problem is is the discrepancy between what stats indicate and how items behave in game. I think everyone welcomes a shift in priority: fix things that hurt the players first, then fix things that hurt Kixeye. In long term, we will reveal content release plan that continues to serve the balanced economy of PvP space. In the coming months we’re going to be working to make PvP more engaging, more rewarding and more exciting. Eventually it would be the experience for broader players. I think you misread 'engaged' with 'enthusiastic'. There are a lot of players that are really connected to the game, they invested a lot in the game and the communities linked to it. And they like to play (when it is possible). But I see less and less enthusiasm. Most alliances deal with players that drop off, their communities are getting smaller and smaller. Players leave the rat race, they no longer want to follow the strict game play forced by Kix. The difference between 'haves' and 'have-nots' is so big that it is not realistic to cross that gap (for many). Skill and strategy, two things this game no longer requires. It's all about who coins the best fleets. When fleets can kill a base without being touched by a turret, it isn't a balanced fight...no skill. Back 5 years ago, you had to peek a base, look at the setup, decide what fleet/fleets to use, then attack. Back in the day, there were HUGE sector wars, smack talk on coms and IT....WAS...FUN! You with the big bad fleets, you have no skill. The fleets you bought have made you a higher level, not skill. I've tried to play "catchup" after been gone a while, and have seen the unbalanced play Kix has developed. Unless you played back then, you'll never know the difference of how game play has changed. And to think back then, we accused Kix of being money hungry, boy, have they taken their steroids on greed over the years. Kix..get back to the basics, quit introducing so many types of fleets and balance the game. Get your head out of your b*tt and admit there are issues on balance, allow the people trying to get back in the game a chance to get the higher tier prizes...especially turrets! !